The web-based translation engines implemented in ImTranslator perform real-time translation between more than 90 languages and 3 translation providers: Google Translate, Microsoft Bing Translator, and others. Compare online translators and choose the best translation. Microsoft Translator implements statistical machine translation platform to translate between 55 languages developed by Microsoft Research, as its backend translation software. Microsoft developed a translation portal as part of its Bing services to translate texts or entire web pages into different languages. When translating an entire web page, users are allowed to browse the original web page text and translation in parallel, supported by synchronized highlights, scrolling, navigation and language detection. 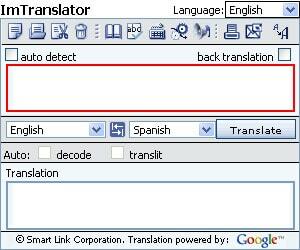 There are several approaches to the machine translation technology. The statistical machine translation approach generates translations using statistical methods based on bilingual texts. It uses existing source and target language translations (done by human translators) to find patterns it then uses to build rules for translating between those languages. The statistical approach allows improving the accuracy of the translation with more bilingual texts utilized. Where such corpora are available, impressive results can be achieved translating texts of a similar kind, but such corpora are still very rare. Machine translation systems work with natural language, a data set that is infinitely varying, ambiguous and structurally complex. To translate adequately, the rule-based machine translation system must encode the knowledge of hundreds of syntactic patterns, variations, and exceptions, as well as the relationship among these patterns. MT system must include the dictionary and specific semantic knowledge about the usage of tens of thousands of words. The system is to ensure the accurate identification of the part of speech and grammatical characteristics of words with may in different contexts be nouns, verbs, or adjectives, each having many possible translations. The online translators implemented in ImTranslator perform real-time instant translation for Afrikaans, Albanian, Arabic, Armenian, Azerbaijani, Basque, Belarusian, Bengali, Bosnian, Bulgarian, Catalan, Cebuano, Chichewa, Chinese (simplified), Chinese (traditional), Croatian, Czech, Danish, Dutch, English, Estonian, Esperanto, Filipino, Finnish, French, Galician, Georgian, German, Greek, Gujarati, Haitian Creole, Hausa, Hebrew, Hindi, Hmong, Hungarian, Icelandic, Igbo, Indonesian, Irish, Italian, Japanese, Javanese, Kannada, Kazakh, Khmer, Korean, Latin, Latvian, Lithuanian, Macedonian, Malagasy, Malay, Malayalam, Maltese, Maori, Marathi, Mongolian, Myanmar (Burmese), Nepali, Norwegian, Persian, Polish, Portuguese, Punjabi, Romanian, Russian, Serbian, Sesotho, Sinhala, Slovak, Slovenian, Somali, Spanish, Sundanese, Swahili, Swedish, Tajik, Tamil, Telugu, Thai, Turkish, Ukrainian, Urdu, Uzbek, Vietnamese, Welsh, Yiddish, Yoruba and Zulu languages and their combinations.